NEW!! HOMEDICS MICRODERMABRASION REPLENISHMENT KIT #MD-RFL NEW! 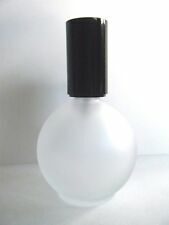 Gift Boxed ~ Silver Spray Perfume Travel Atomizer ~ 10ml ~ Refillable. All three bottles are fully hallmarked Birmingham 1926, makers mark W C Griffiths for Asprey. Marked to the front, Asprey London, in gold tool work. The set is complete with bottle, parfum, lid, silver wire wrap, label, presentation box, and original paper in the box. The glass bottle is in excellent condition as is the lid. The bottom of the bottle is marked Figene. 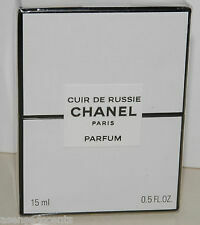 Chanel Cuir De Russie Pure Parfum-.5 fl. oz/15 ml-New in box-Cellophane Sealed. Authentic Chanel. Oz-Full bottle-no lid or box. 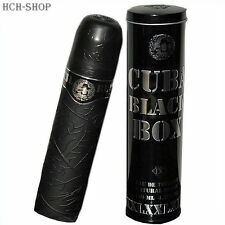 Cuba XXL Black Box Eau de Toilett. Beliebt und etabliert. Ein tolles Geschenk - oder sich selbst einfach etwas gutes gönnen. Herren Parfum. Herren Parfum aus dem Hause "DIAMOND-PARFÜMS-PARIS". bereits X-Tausend Kunden. Contained in its own velvet-lined box, this would be ideal for your handbag or suitcase. Weight (with funnel): 15g/0.48 troy oz. Width: x 1 3/8in / 3.5cm. 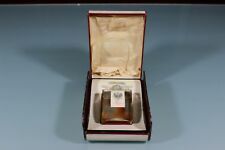 The atomizer is marked made in England and the solid silver collar only retains the makers mark, hallmarks are illegible. Oz-Full bottle-no cap and no box. Persian Essence "This must have been an "attic find" as the bottle shows no evidence of burial in the ground (throw away item) and also, the label has survived, which would not be the case had it been buried! Genuine Sigma Beauty Makeup Brushes with Black "Dry and Shape" Case. Authentic.. This is an authentic Sigma Beauty "Dry N Shape" Makeup Brush Case. Never been used. The brushes themselves are in excellent condition and all intact. It's my opinion that it's sigma's high quality that they strive for, therefore a small buff mark gets rejected.The following brushes will be included with the case. YOU WILL NOT BE DISAPPOINTED AS WE PRESENT WEEKLY. WE DO NOT PUT LOWER VALUES ON CUSTOM FORMS. The screw-in dauber is all sterling, marked "Sterling" on the cap. You can scroll down to see more photos. 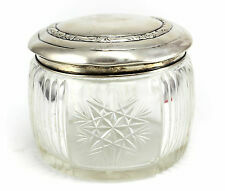 It is in very good condition, with light signs of use and a little tarnish. There are no dings, dents or bends. 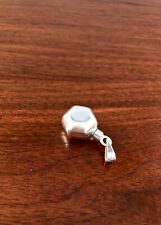 UP FOR SALE IS THIS STERLING 313 SILVER LOCKET WITH A MONOGRAM ETHING. THE SIZE IS 1"1/2 X 1"3/8 SLIGHT TARNISHING AND WEAR MISSING A HINGE PIN OTHERWISE THE CONDITION IS GREAT. Lid Weight 24.56g, total weight 8oz. Gallery XV specializes in a variety of art, antiques, jewelry and collectibles. Condition: Light scratches and light oxidation to the silver. One large dent & a few small dents to the silver. There are two date 1913 and 1886. Item is engraved with "Betty". There are minor scratches. Otherwise item is is great condition. 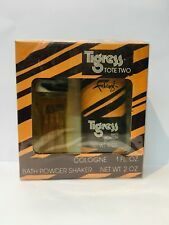 Nina Ricci refillable atomizer 1/5oz in original box. I'm not sure which. It's about 4 1/4" tall from bottom of bottle to the very top of the highest wing. It's about 2/3 full as the photographs indicate. Oz Glass Bottle--Very pretty toile design on box and bottle. This was sealed in cellophane when I received. I unwrapped just to check the contents. It has not been used so bottle is full. Dabei bestimmten wir einen Start- bzw. Vor der verbindlichen Übermittlung Ihrer Vertragserklärung werden Sie zu einer Bestätigungsseite geleitet, wo Sie Ihre Kaufabsicht bzw. Die angegebenen Preise sind Gesamtpreise incl. Bottle is close to full as photo illustrates. No exceptions! Powder container is fine, it's just the outer box that is very worn. Innen sehr gut erhalten, außen finden sich Kratz- und Schleifspuren. und stehen im Eigentum der jeweiligen Rechtsinhaber. Design: Sixties Tanz Clutch. Material: Silber, Gold, patiniert. Hier eine zauberhafte " Gräfin Patrizia " Clutch. Has traces of a scent. Very cool Deco piece. We do not deceive. All flaws are either photographed or described or both. This item is USED and NO BOX. We will work with you directly to resolve any issue you may have. 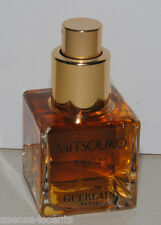 Oz splash bottle--I'm not sure of the strength of this fragrance as the bottle is not marked that I could find. Bottle has been gently used. Die anderen Bilder zeigen ausschließlich Nutzungsbeispiele ! Vom Verkäufer selbst werden keine Vertragsdaten, Verkaufstexte oder kundenbezogenen Daten gespeichert. Maße siehe Skizze im letzten Bild ! This item is USED and NO BOX. THE BOTTLE SEEMS FULL BUT YOU BE THE JUDGE. NOT NEGOTIABLE. We will work with you directly to resolve any issue you may have. Nice boxed set that includes a 1.0 fl. The bath powder is paper sealed and unused. Entire set looks to be unused. Original Review, taken from a Publication of the date given. Auriege x2. Haute Coiffure Francais. Height of Timis pin as shown, 3.5cm. For sale is acollectable lot. In very good,clean condi tion. This item is new and SEALED box. What you see in the pictures is what you are going to get. Oz/15 ml--Bottle is just about full. I have sprayed once just to check the atomizer. 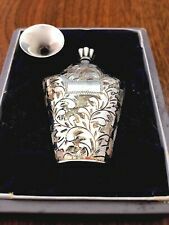 I believe this is a c.1930 Matson Ormolu rose perfume bottle vanity set that is gold plated and was enameled sometime later. The paint is starting to come off on the edges showing the gold and you might be able to remove the paint if you choose. The items will need a more thorough cleaning around the edges because I did not want to disturb the enamel. The mirror is starting to desilver around the outside but most of the mirror still looks good. On the backside of the mirror some felt around the edges is worn off but most of it s is still present. The bottles have both of the dobbers and I did not see any cracks or chips on any of the items. All in all this is a really cute set. If you have any questions please feel free to ask. Thank you for looking and have a great day. Still in the original box with illustrations of flowers and old fashioned looking girl. 100% original, genuine, authentic 1990s collectable gift-box/presentation box for 'Opium Yves Saint Laurent'. 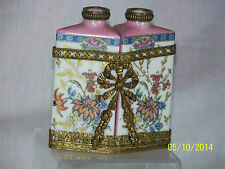 Or of course, use as jewellery box etc. Solid sturdy rectangular box. I can also send by ' box2box', if requested. Bottle is empty. 3 3/8" tall. PATENT SPECIFICATION No. 10,853. APPLICATION DATE: 24th May, 1899. SPECIFICATION ACCEPTED: 19th May, 1900. Size: 195mmx270mm. of pages of text: 3. The drawings are often ideal for framing.